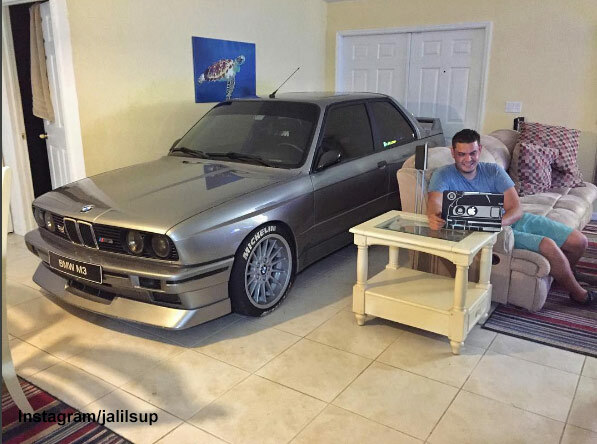 When Randy Jalil saw the forecast that Hurricane Matthew was headed his way, he looked at his 1988 BMW E30 M3 and knew he had a job to do. "I had two other cars in a garage and wanted to be sure they were all safe," Jalil told 6abc Action News. 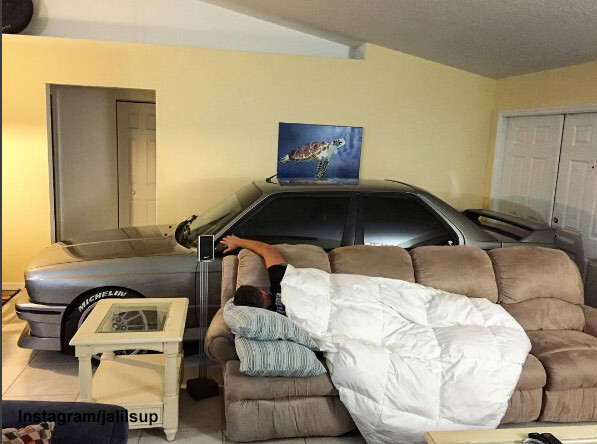 So Jalil formulated his plan: Get the car into his house to protect it from the storm. 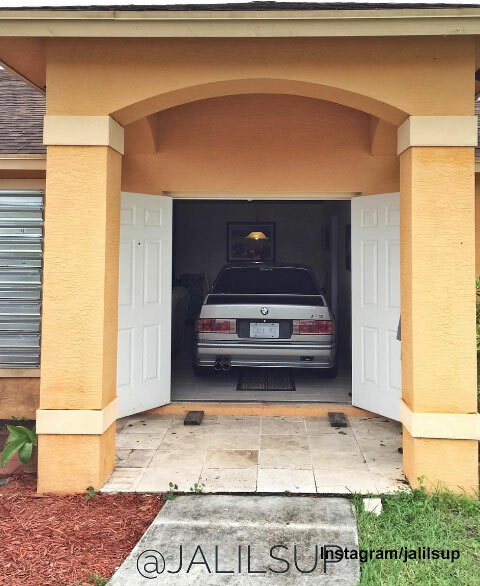 The only question was - could his BMW fit into his Port Saint Lucie, Florida home? "My car isn't very large so I first measured my door sills from side to side. I got a measurement of 73", a lot larger than the width of my car. So I first tested to see if I could get it through with my side view mirrors installed," Jalil said. Jalil said he had just "inches to spare," but it fit. "It was easy to guide into the house with the help of my father. There was enough room," Jalil said. With his father's help, they were able to get the car inside. Jalil, who recently moved back to Florida after being in the United States Air Force for seven years, said he hasn't dealt with weather like Matthew in a long time. "I wanted to be sure she was safe! (She being the car) It's my pride and joy and any of my friends that know me understand how much I love it!" Jalil said. 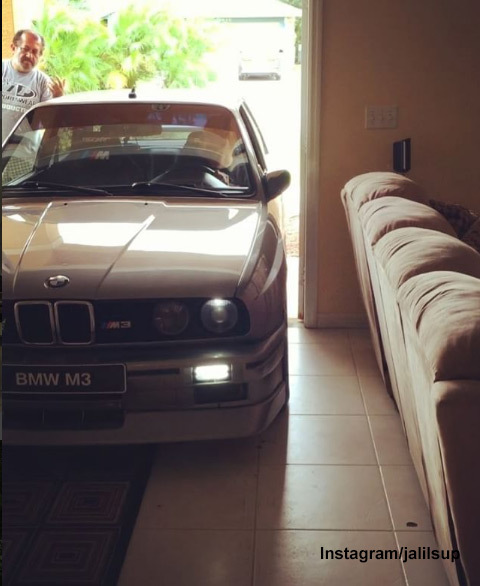 He pointed out the 1988 BMW M3 is the first generation and worth a lot of money. "The last thing I needed was any kind of damage to my car," he said. 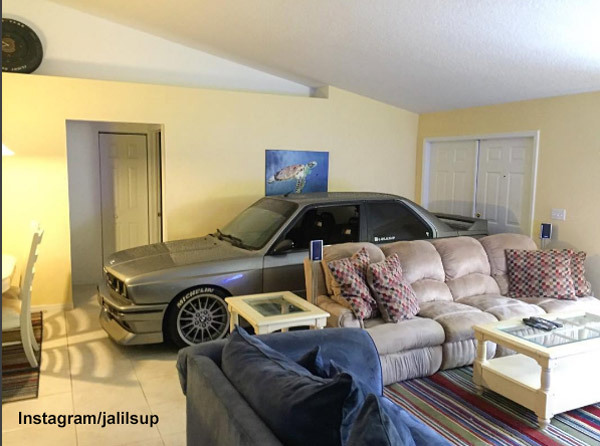 Jalil's pictures and videos on Instagram of him hanging out with his car inside his home have gone viral with over 10,000 likes on one particular photo. 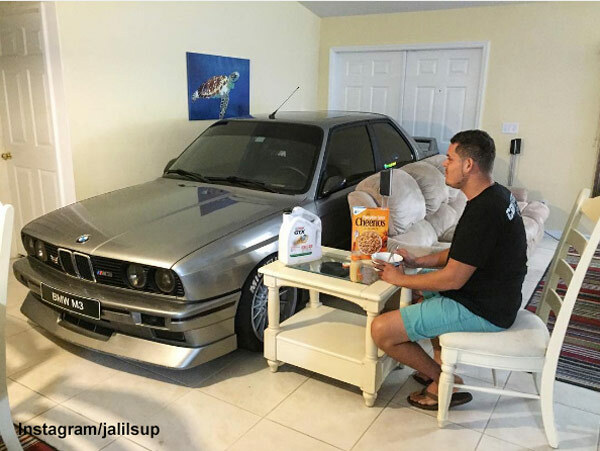 "We enjoyed a nice breakfast together the morning after the hurricane," Jalil joked. For his new followers, he posted a video of his father and him getting the car back outside - successfully. In a post after the storm, Jalil reflected on his newfound fame: "Huge shoutout to all my new followers! I can't believe how viral my photos went around the Internet. It was all over the world. I'm happy to say nothing happened during the hurricane and my car was safe." Asked if he would attempt this feat in the future should another severe storm come his way, the New York native told 6abc Action News, "I wouldn't hesitate to do this again."